Dental fillings restore a damaged tooth caused by tooth decay through filling its cavity. Fillings close off spaces where bacteria can thrive, thus averting further damage and decay. Types of dental fillings include gold, amalgam (silver), composite (plastic), and porcelain fillings. In some cases, fillings may come loose due to the decay that has developed below it. Because of this decay, there will be changes in the shape of the tooth and causes the filling to fit improperly on the tooth. Biting too hard on a tooth that has a large filling. Saliva enters the cavity while the filling is placed. As with composite resins, this unsettles the bonding of the material. Thus, the bond will not stick properly to the tooth and might fall out. Small cracks that happen at the edges of fillings because of wear over time. Leaking fillings may occur once the side of the filling does not fit firmly against the tooth. Clenching and grinding of teeth. Remove the filling from your mouth to avoid swallowing or breathing it in. Contact your dentist for scheduling of your appointment so that your filling can be replaced. Talk to your dentist regarding the filling and discuss the reasons why you lost it. Practice accurate oral hygiene around the affected area of the filling. Gentle but careful brushing must be considered in removing food debris inside the hole. It’s also advisable to rinse your mouth with a warm saltwater solution after eating. One cup of warm water and one teaspoon of salt will make an effective rinse. The dentist will discuss treatment options with you before the removal of your old and defective filling. More often than not, repairing an old filling is prefered instead of eliminating it and replacing it totally. Nevertheless, if the whole filling has to be changed, your dentist may re-evaluate the kind of filling to be applied. 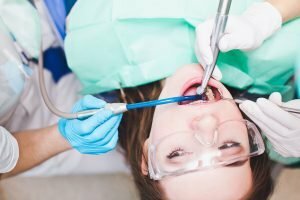 Talking with your dentist regarding how you would want the filling to appear, allows both of you to pick the material that best suits your needs. Once you lose a filling, be sure to pay attention to your teeth and consult your dentist immediately. Seek urgent assistance from the professionals; seek best solutions for your lost filling from your trusted Brisbane dentist. Make it here at Precision Dental. We provide suitable dental treatments for your lost filling through our cutting-edge dentistry solutions meant to address various oral and dental problems. Call us today on (07) 3852 1160 or book an appointment online.